This tisane has a very interesting flavor. When I ordered it, I had expected it to be a spicy/sweet kind of taste, but, I don’t know that I would classify it as either spicy or sweet. I would call it savory. But I consider this a nice surprise as my expectations were based entirely on the name of the tea and list of ingredients – not a lot to go on. The rooibos offers a mellow woodsy/nutty tone to the cup that is further accentuated by the spices. The malt adds a certain richness to it, and the chicory adds a savory bitterness to the cup. The combination of these ingredients plus the spices give the tisane a very well-rounded flavor that I don’t usually experience with rooibos tisanes. As I said, the spices themselves – the cardamom, cinnamon, ginger and black pepper – don’t create a very spicy blend – it is spiced, certainly. It just isn’t spicy as the spices are very much in harmony with one another. That being said, there is a hint of peppery tingle that hits the tongue in the finish that I find rather enchanting and keeps me sipping. If I were to change anything about this blend, it would be the level of chocolate flavor. It is not nearly as chocolate-y as I would like it to be. That being said, the chocolate flavor does develop a bit as the tisane cools slightly, but it is still more savory spice than it is chocolate. This is the first of several teas I’ve ordered from Sands of Thyme, and it is a pleasant one. Maybe not my favorite rooibos blend, but one that I certainly enjoyed and am glad I tried. 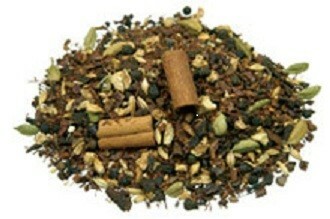 It is one that I’d recommend to those who enjoy a savory, full-flavored tisane.